We grill pretty much the whole year, including this past winter, definitely the hardest I’ve endured, but somehow survived. I actually feel I survived against all odds, but my beloved (rolling his eyes to the ceiling) insists that “it wasn’t that bad”. We fully disagree on this. Anyway, as I was saying, we use our grill all the time. If necessary, we brush the snow off and go to work. Of course, it’s much nicer to grill when the sun is shinning and the temperature starts to get where I like it, mid 90’s. We are not quite there yet, but the sun has been shinning as bright as the apricots for these skewers. The recipe from Bon Appetit is absolutely delicious! Coconut milk, peanut butter, and cilantro make a marinade-sauce combo very hard to beat. Purée first 6 ingredients and 3/4 tsp. salt in a blender until smooth. Add 1/4 cup cilantro leaves and jalapeño and blend briefly to combine. Transfer 1/2 cup marinade to a small bowl; cover and chill for serving. Place remaining marinade in a resealable plastic bag; add chicken, seal bag, and turn to coat. Chill for at least 3 hours or overnight. Heat your grill to high. 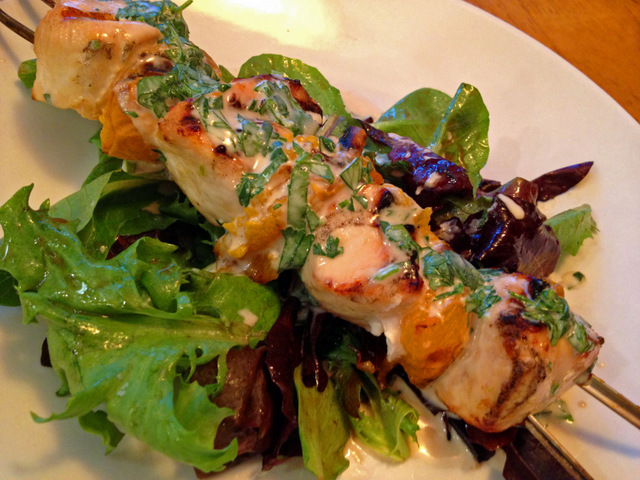 Holding 2 skewers parallel to each other and 1/2″ apart, thread 1 piece of chicken onto skewers, then 1 apricot half. Repeat with 1 more chicken piece and 1 more apricot half (using 2 skewers helps hold the meat and fruit together). Repeat with remaining skewers, chicken, and apricots for a total of 12, each holding 2 pieces of chicken and 2 apricot halves. Season with salt and pepper. Brush apricots with some marinade from bag; discard remaining marinade. Grill skewers on one side until chicken is well browned, 3—4 minutes. Turn and grill until other side is well browned, 3—4 minutes longer. Move to a cooler part of grill. Cover grill and cook until chicken is cooked through, about 2 minutes longer. Transfer to a serving platter, and serve drizzled with the reserved marinade (bring it to room temperature before serving). The apricots were pretty soft after grilling, in fact some bits stayed behind on the grill, but I am not sure this could be avoided. Maybe apricots a little less ripe than the ones I used would stand the heat better. If you prefer a firmer fruit, consider grilling the apricots by themselves, just for a couple of minutes. I actually did not mind their softness, they almost turned into a component of the coconut sauce. Delicious! Absolutely love the moreish marinade: may have to wait some 6-7 months for apricots Down Under, but the marinade being the ‘star’ of the dish, may be able to tweak in the interim!! Still have to smile about language usage around the world: to us, what you are doing is ‘barbecuing’, if one grills anything it is always indoors under an oven grill or electric flat grillplate on one’s kitchen tabletop 🙂 ! And ‘griddle’ as a term does not exist 🙂 ! Stop it! Stop cooking so much! I can’t keep up with you! So much beautiful food! Love this! Well, you’re welcome, but that’s crazy! I don’t think there are any rules except the self-imposed ones when it comes to blogging. I started off posting every single day, then went to weekdays only, and now I’m just about every other day. It was stressing me out a bit, which is ridiculous, because this is all supposed to be fun. So I’m relaxing a bit more about everything. But seriously, I love your food!!! 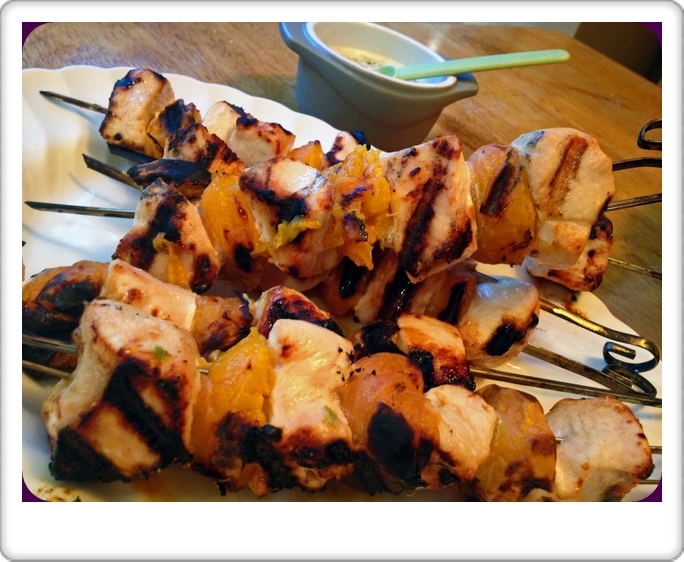 You’ve got some lip-licking flavors going on in these apricot skewers Sally! And I’m smiling at the prospect and possibility of grilling all year round up here…heehee, my brother-in-law does it but I think he’s insane! ;-). That last photo has me swooning (so moist & succulent looking!). I thought this winter was BRUTAL…but in reality I guess it was kind of a mixed bag. some really bad days and some totally okay days! I’m definitely impressed that you grilled through it all! Thank you for the empathy. I will show your comment to Phil, so he knows better than rolling his eyes to the ceiling. The nerve! I like it in the 90’s too Sally and I’m with you…this winter/spring has been long and unappealing to me. I’m ready for the heat and sun. 🙂 I think maybe this next year we’ll keep the grill out through the winter. We haven’t done that yet, but I think I’m getting closer to convincing Mike to do it. It’s just hard to beat grilled food – especially these delicious looking skewers. I’ve not done much grilling of meat and fruit, Sally, but this dish you shared could be game changer. That sauce really does sound good and that final photo is the clincher! I need to find me some apricots! Thanks for sharing! My oh my, Sally….we need to make this as soon as possible! I love grilling too. It adds such flavor to meats and vegetables (and fruits too!) This marinade sounds heavenly, and I’m sure the sweetness of the fruit provides the perfect contrast to the meat. Thank you for sharing, sweet friend! That’s some mighty fine grilling! Haha.. we grill with parkas on all through the winter months! I’ve pinned this one, I love the sounds of that beautiful marinade/sauce and the combo with apricots.. wonderful update to my boring old chicken recipes! Sally I made this tonight and it is a keeper, so delicious. Used apricots from my FM that were pretty form and still lost a bit to the grill, but their flavor was sublime. Definitely will put this in my early summer rotation for when apricots are available. The idea to use two skewers is brilliant, even though I made quite a mess with the marinade.